In this article we will explain Landfill Quality Assurance (QA) and the importance of ensuring that the universal principles of QA, are applied to landfill construction and development. We will elaborate on why QA is so important for a landfill, especially a landfill liner later in this article. But, meanwhile we would ask our readers to consider how a mistake which lead to a leaking landfill liner could be repaired? How would the repairer get to it, under 30 to 60 metres of waste? For that very simple reason, which is that landfill liner repairs are uniquely difficult to repair, even if money is no object, QA takes on a whole new level of importance. 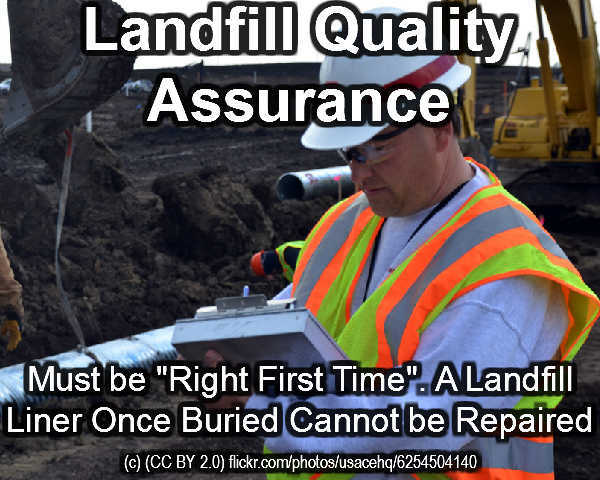 What is Landfill Quality Assurance? Landfill Construction Quality Assurance comprises management and also procedural activities executed in a quality system so that needs and objectives for a product, service or task will be satisfied. It is the organised measuring of work quality, comparing that with a stated set of requirements (the specification), tracking of the manufacturing, and installation processes. It is a system when implemented as a whole is designed to identify errors before they are incorporated in the work, for the avoidance of lost time, wasted effort and finally, to ensure consistently achieving a very high standard of quality. This can be contrasted with quality control, which is focused on process result, and which may include ensuring production at a specified quality at a price, and not necessarily a high quality output. Quality Assurance (QA) is a means of preventing mistakes or defects in made items, which applies during the design stage to prevent problems when supplying landfill design solutions as a services to clients. This is where QA is used for landfill projects in applying ISO 9000. This ISO defines QA as a component of quality management focused on providing self-confidence that quality needs will certainly be satisfied. This avoidance of “flaws” which is at the heart of quality assurance differs discreetly from problem detection as well as rejection in quality control, and has actually been referred to as a shift upstream as it concentrates on quality earlier than was possible in the past, while doing so. In all areas of production it is now appreciated that identifying faulty output at the end of the production line, is a mistake and results in huge wastage. It is even more important in landfill design and construction due to the almost impossible task of repairing a lining membrane after it has been buried under waste. To look at it another way, Landfill Quality Assurance is basically a procedure that was developed to examine if the products or services made or sold satisfy, exceed or fall below the needs and expectation of the customers. It is an action sensitive approach and broken up into processes. The actions include the appropriate designing of the item, its procedure for using the right raw-materials, the manufacture of the product (in this case landfill lining and capping work) and succeeding services provided to the client such as maintenance and servicing. Who Does the Landfill QA System Work? Landfill Quality Assurance roles normally come under the titles of quality supervisor or quality monitoring manager. These specialists are monitored for their effectiveness, and are accountable for setting up and also applying quality administration standards and systems for the company they are used in. To provide Landfill Quality Assurance Quality guaranteeing professionals make sure that every produced item, or marketed merchandise are without flaws as well as are of the greatest feasible quality. Together with managers, there are also entry level quality assurance jobs such as inspectors, along with QA testing technicians. the work, service or product must “best and right the very first time” (to put it bluntly blunders must be eliminated). QA consists of management of the quality of raw materials, assemblies, products and also parts, and also provides solutions related to ensuring the quality of design, production, and administration, as well as including methodical examination procedures. In Landfill Development as well as general building tasks, the landfill construction quality assurance practices should be satisfied by adhering to the quality control methods defined by the International Standards included in the ISO 9000 collection and the specified Specifications for quality systems. Continual quality improvement in Landfill development, just as in other areas of expertise, does not merely occur, you should prepare plans to ensure that it happens. This is so important for landfill CQA (Landfill Quality Assurance), because a failure here can mean many years of underground water pollution, and the loss of the underground water for the use of the people living in an area can be a serious health and livelihood problem.